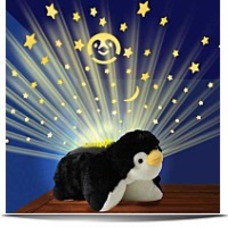 The Pillow Pets Dream Lites Penguin is the night lite that makes bed time FUN! One can switch the light into timer mode which will trigger the light to shut off automatically after 20 minutes. Built in timer shuts off after 20 minutes. The face of the certain pet is also projected along with the stars. 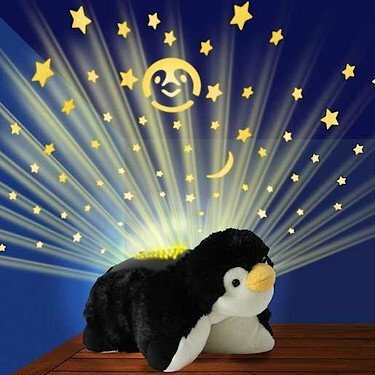 Pillow Pet Dream Lites are the amazing nightlight that turns your area into a starry sky instantly. All the Dream Lites come with 4 light options: steady blue, amber, or green and the 4th is all three colors that transition every 4 seconds continually in a loop. Creates a magical and tranquil environment that helps kids ease into a restful sleep. They are even great for playtime. Folds up into a pet or opens to lay flat. Simply press the button it projects a starry sky on your ceiling and walls!